The Texas State Cemetery is located approximately one mile east of the State Capitol between Navasota and Comal streets and consists of 18 acres. 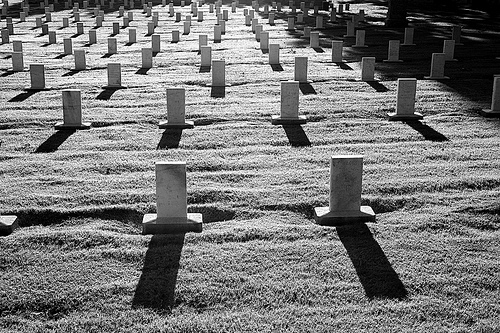 The Cemetery provides a final resting-place for individuals who have made a significant contribution to Texas. Stephen F. Austin, 11 governors, numerous legislators, judges and unique individuals throughout Texas’ history are some of the people buried at the Texas State Cemetery. The first person buried at the Texas State Cemetery was General Edward Burleson. Burleson emigrated from Tennessee to Bastrop County where he helped organize volunteers at Gonzales and was elected Stephen F. Austin’s senior colonel. As colonel, Burleson also helped Ben Milam organize and seize Bexar County, the first major skirmish for Texas Independence. An important part of the Battle of San Jacinto, Burleson commanded the First Regiment of Texas Volunteers. Following Texas’ fight for independence he served in the Cherokee and Mexican War. At the same time, serving as Vice President of the Republic of Texas, Member of the Texas House of Representatives and Senate, and President pro tempore of the Legislature. In December of 1851, Burleson died in Austin at the home of a friend, and the next day a Committee was convened in the House of Representatives to plan his funeral. House member Andrew Jackson Hamilton, who was impressed with Burleson and his career, took charge of the committee and provided his personal property in East Austin as a state burial ground which the state eventually took over in 1854. Burleson was the only individual buried in East Austin until Abner S. Lipscomb, Associate Justice of the Texas Supreme Court, was buried in 1856. From 1856 to 1866 there were a number of burials that included some of Texas’ most widely known leaders, Civil War generals, and other soldiers from Texas’ fight for independence and the Civil War. In 1866, Albert Sidney Johnston’s body was brought to the Cemetery from New Orleans. Thirty-five years after Johnston’s return to Texas and the state burial ground, the renowned artist Elisabet Ney was commissioned to construct a monument for the fallen hero. A life-size death mask was constructed of white marble and housed in a gothic chapel. Many of Johnston’s fellow generals such as Ben McCulloch, William P. Hardeman, John Wharton, August Buchel, and Xavier Debray are also buried in the Cemetery. In the latter part of the 19th century, the State of Texas took over the Confederate Men’s and Women’s Home. 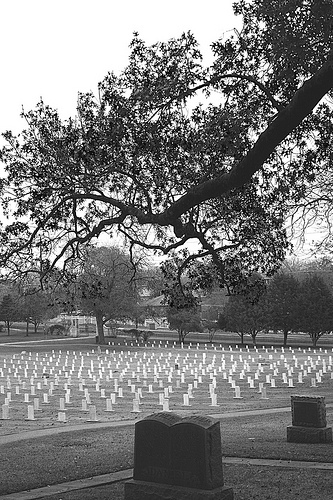 As more and more men and women were passing away there became a need for a burial space that would be able to accommodate them; as a result the Cemetery was chosen so the veterans could be memorialized with their former generals. In 1871, the sexton was authorized by the Legislature to purchase and have inscribed the name, date of birth and death, and unit with which the veteran fought. Each headstone was not to exceed $40 dollars. In the early 1900's there were many ambitious projects on the horizon. The first of these was the construction of the Albert Sidney Johnston monument that was completed in August 1906. Sixty years after their initial plan to reinter Stephen F. Austin the Legislature brought his remains to the Cemetery and erected a monument in his honor. The reinternment of Joanna Troutman and General John Wharton were initiated and encouraged by Governor O. B. Colquitt (1910-1915). Among other projects during this time the caretaker’s cottage was built, trees, shrubs, and flowers were planted, a drainage system was installed, and roads were improved. The 1920’s saw a renewed interest in the Cemetery as Texas prepared for the approaching centennial. Louis Kemp, noted businessman and historian, headed up one of the more ambitious plans undertaken by the State when the Senate passed Senate Bill No. 181. This particular bill called for prominent Texans to be reburied and have monuments erected at the Cemetery. The project began in 1929 with the reinternment of James Pinckney Henderson, Peter Hansborough Bell, and many other Texas notables. The project lasted until 1936 when over seventy men and women were reinterred. As a special thanks to the efforts of Louis Kemp the State Highway Department named the Cemetery road Lou Kemp Avenue. One of the more important events that occurred was the establishment of burial guidelines. In 1953, new guidelines were adopted that specified who might obtain a plot. They must meet one of the following requirements: member or ex-member of the Texas Legislature, Confederate Veteran, elected state official, state official appointed by the governor and confirmed by the Legislature, individual designated by governor’s proclamation or concurrent resolution of the Legislature, or the spouse of anyone meeting these criteria. These guidelines are still in effect to this day. In 1994, Lieutenant Governor Bob Bullock, unhappy with the condition of the Cemetery, organized a full scale renovation and restoration project. The project included the construction of a visitor’s center and gallery, pond, columbarium wall, and a memorial plaza. All Confederate headstones were taken down and cleaned and were replaced if damaged. Trees, shrubbery, flowers, and grass were planted for the beautification phase of the project. In March of 1997, a rededication ceremony was held with Governor George W. Bush, Lieutenant Governor Bullock, Speaker of the House Pete Laney, and other distinguished guests in attendance. In 1997, the Legislature formed a Committee that oversees the everyday operations of the Cemetery. The Committee is comprised of three members who are appointed by the Governor. The first Texas State Cemetery Committee members were Chairman Martin L. Allday, George Christian, and Ralph Wayne. The Committee meets monthly and holds open record meetings that are posted in the Texas Register. Current Committee Members are Chairman Benjamin M. Hanson, James L. "Jim" Bayless Jr. and Carolyn Hodges. Freeman, Martha Doty. "History of the Texas State Cemetery." Confederate Veterans at Rest: Archeological and Bioarcheological Investigations at the Texas State Cemetery, Travis County, Texas. Ed. Douglas K. Boyd. Texas Parks and Wildlife Department, 1996. 23 - 30. "History of the Texas State Cemetery at Austin, Texas" Texas Pictoral Handbook (Summer and Fall 1957): 89 - 90. Kelso, Helen Burleson. "Burleson, Edward." The New Handbook of Texas, vol. 1. Ed. Ron Tyler. Austin, Texas: The Texas State Historical Association, 1996. 837 - 838. Marten, James A. "Hamilton, Andrew Jackson." The New Handbook of Texas, vol. 3. Ed. Ron Tyler. Austin, Texas: The Texas State Historical Association, 1996. 427 - 428. Muir, Andrew Forest. "State Cemetery." The New Handbook of Texas, vol. 6. Ed. Ron Tyler. Austin, Texas: The Texas State Historical Association, 1996. 72 - 73.